Do you have a favourite browser? Mine is Chrome. I’ve been using it since Google released it. I love the search bar, it makes life so much easier. Just type in a letter autofill to a site you’ve recently visited or have visited often. Two years ago I started an experiment, how would my searches/sites I visit, change over time? Below is that table, I typed in a letter and chose the first thing Chrome served me back. It’s quite interesting – at least to me! Starting with the As, it seems that I moved from browsing Amazon (still do) to browsing movies and movie times to learning music for my choir/orchestra group – starting in 2015, note the B line. Speaking of Bs, it seems I went from Biking to Singing to Reading – three of my favourite pastimes. C & D show my love for Google and all its tools; from the Calendar to the Google Voice (2014 the year I actually went on dates with strangers) number that I created years ago. This year a lot of people moved back to Evites – from Facebook Events. Let’s skip over Facebook and Gmail and head straight to the fact that I still have not won Hamilton tickets, even though it’s one of my most visited sites! There’s a lot of work related sites as well – Intranet, ESP, QA, Outlook and the Scholastic Store. But that makes sense, I do spend many hours a week there. The Us are very interesting – there must have been a U book for that Goodreads entry in 2014. Then I went from tracking packages last year to looking at health insurance this year – thanks, conjunctivitis. Overall, nothing too shocking for me here. I’m assuming my 2017 will be pretty close to my 2016, who knows, maybe I’ll do an addition next year. I went to bed last Monday to the sound of the wind outside. Trees were bending in all directions, some almost bowed over, touching the ground with their branches. There were things banging against the side of the house and roof. The house was swaying and there were odd flashes of orange and white in the sky, but no sound of thunder. That night, I dreamt of destruction. On Tuesday morning, the destruction was revealed. Thankfully, we only lost a piece of siding and electricity, but the news of devastation was slowing trickling in over the cranked up radio, Long Beach was under water. No gas. No Electricity to thousands of people. Entire houses floated away with the tide. Trees cut houses in half. Cars moved like matchboxes down the street. In the aftermath of Sandy, the death toll rose, people were left without homes, fuels, water, electricity and gas. The city that never sleeps was half blinded by darkness, forced to stop everything and recover. Manhattan was crippled. Some are still without those things. It’s a bit unreal what is going on. Last week involved a lot of cleanup. I spent the entire day on Tuesday getting food to family who were without food and electricity, helping to clean up the mess that the flood left behind. Sometimes I can still smell the stench of the salt water from the bay that covered three feet of their first floor. My house regained electricity late Wednesday night. The thing though – about having electricity and not a lot of damage and only having to only worry now about a gas tank and transportation to work – I can see how easy it is to forget the hurt that some are still experiencing. Crisis reveals character, and I hope that in this crisis you saw who you want to be revealed in the things you did and said. A lot of help is still needed, things are still not back to normal for a lot of people. Work still needs to be done. I’m deeply touched by the stories of heroism that came out of the storm, but I’m also sad at the slim-balls that crawled out of the gutters; the people who preyed on those in trouble. There are people who still need help, there are many ways to give of your time and money to help those in need if you can, you should definitely look into it. 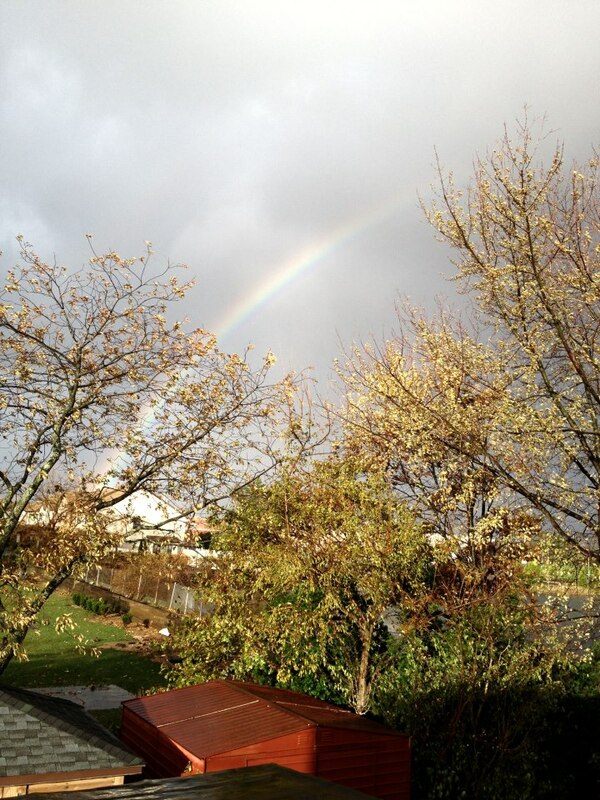 The photo below is from the morning after Sandy, after the floods came and receded. I look at this photo and I see hope. We are alive, we are well, there is hope. I have set my rainbow in the clouds, and it will be the sign of the covenant between me and the earth… I will remember my covenant between me and you and all living creatures of every kind. Never again will the waters become a flood to destroy all life. I hope that, like Irene, Sandy will just pass us by, but there is always that small anxiety that this one might be worse than the last, that the lessons gained from the past experience will not be applicable to this current one and that all our preparations were in vain. Sometimes it’s not destruction, but the expectation of destruction that causes anxiety. Does that mean that I shouldn’t prepare? That I should just give up? These are just things I wonder. I think preparing for things ahead is important, but I think knowing that, even with preparation, things might not turn out great is also important. In any case, be safe, smart and find a good book to read. It’s time to weather the storm. I have a problem. Well, I don’t view it as a problem, but it was enough of a problem to get me into trouble! We have these parking meters in my neighbourhood, they are a bit on the ancient side. One meter serves two spots and you need to fill it so the correct spot has the quarters needed. After parking my car, I pressed the top of the two buttons (left) and entered my quarters inside, it ate one of my coins and I had to give it an extra quater to make the 9.5 hours I needed before 6pm. Then, I pressed the bottom (right) to make sure that I didn’t put the quarters into the incorrect section. Satisfied I took my things from the car and rushed to the train station. When I came back that evening, I noticed a bright yellow envelope on my car. Immediately annoyed – because I was certain I fed the meter with two extra coins! I read the ticket, it was issued at 5pm, surely something is wrong here, I was certain that I put enough coins in. Then I looked at the meter and noticed the faint arrow around the left button, it was pointing away from my car. Apparently Left-Right Confusion is a thing, not that me knowing that it’s a thing will get me out of a ticket. Can you imagine my case? “No Judge, I just have this thing called Left-Right Confusion where I mistake my left from my right. Nothing to worry about, just a minor thing.” Yes, I really don’t think that will go over well enough. No, I think I’ll just ride my bike to the train station instead. Some of the memorable highlights of the opening ceremony! The theatrics in the beginning… I especially loved the Maypole and the different scenes in the grass – picnics, rugby … and the transformation. It’s a shame that NBC didn’t do a good job showing the different scenes depicted in this display of historical Britain before the introduction of the industrial revolution. I mean, real sheep on the set? What’s not to love? The forging of the rings. Definitely a fan of this! Flying rings of fire gets the gold for sure. The world’s greatest nanny – Mary Poppins – coming to save the day! This tip of the hat to the NHS and to famous British children’s literature, a segment that started with J.K. Rowling reading from Peter Pan was fun to watch. Especially identifying the different villains. Of course, it’s not without it’s controversy as some – who will not be named – seemed to believe that it was a blatant political move. Maybe it was, maybe it wasn’t, all I saw was some very lucky kids having a lot of fun at the Olympic opening and some hard working doctors and nurses honored for their work and Mary Poppins (my favourite nanny), a symbol of imagination. Also, some really awesome umbrellas that I kinda want. The Queen and James Bond and some cute doggies. Oh that Queen, shocking the world with her sense of humour. Mister Bean and Chariots of Fire. In true Mr. Bean style, this segment had me laughing at his hilarious facial expression and running scene. The way the torch was lit! What a way to light the torch! Why isn’t there more talk of the symbolism behind this? One torch lit by 200 and some tiny torches, burning brightly for the remainder of the games! Of course, there were some huh moments, like the cover of Come Together, was it just me, or did they sound a little low energy? And, Hey Jude, I mean, I love The Beatles and great for Paul McCartney for singing at the ceremony, but, I am sure there were many more songs that he could have sung than Hey Jude. And please don’t say it’s for the sing-along value, a lot of people in the world know many more songs and if they wanted people to sing along they just had to put the words up somewhere. I mean .. they have the entire stadium lit, it’s not impossible! Overall it was enjoyable. Different. Unique. A great display of history. And of course, it was also fun to watch it while having a running commentary on Facebook with a few friends. My status because Olympic size, totaling 1006 comments. Not bad for seven or so people. I travel to work on the Long Island Rail Road and I tend to notice interesting bits of behaviour. One behaviour in particular is the inability of passengers to say, “Excuse me” when they want to exit a row. The typical train has 5 seats in a row – three on one side of the aisle and two on the other – there isn’t enough space to pass the person sitting in the aisle seat without first asking them to move. So, how do they indicate that they need to exit? Well, it’s really simple … they start to fidget. They gather their things and angle their bodies and there is this expected agreement that this fidgeting means they want to exit. This reminded me so much of a post on “She’s not from Yorkshire1” that, one day, when I was in a particularly mischievous mood, I decided to see what would happen if I ignored the “I need to leave” cues. We were waiting to pull into the station at Jamaica – a big transfer station – when the lady next to me started to gather her things and angle her body. I wasn’t listening to music, only reading a book, and I decided to be conveniently engrossed in the paragraph that I was reading. This wasn’t difficult, the book was a good one2, and I was at a good part. It took her a moment to realise that I was missing her cues, but she finally said, “Excuse me!” and so I said, “Sure!” and got up. Thankfully she was nice about it3. I just find it interesting, wouldn’t it be easier – and quicker – to say, “Excuse me!” than to fidget and wait for the person next to you to notice? 1 They do that in NYC as well! 3 I was lucky to get a decent person, not all people are decent and not all people will react politely. Basically, this is a disclaimer saying, “Reactions may vary, so observe with wisdom”. I was minding my own business, sipping on my very caffeinated drink, contemplating important life decisions – should I take the train that stops 8 blocks away from the office, or one? – and generally minding my own Monday Morning business when a voice calls out, “EXCUSE ME!” and a woman tries – unsuccessfully – to push me out of the way, rushing in front of me to get down the stairs. I stopped to allow her to go, I figured someone in such a hurry must either be running away from something, or running to something. Since it didn’t look like she was running away from anything, it might just be best to let her run to whatever she was in a hurry to get to and save myself some coffee stains. I think she realised how rude she was being so she said I should go ahead, except, she didn’t say this politely, it was more along the lines of “No, no, go, go, go, go, go!” with each go getting louder and more urgent. Figuring she really needed to go I indicated again that she should go ahead of me. “Just go, I’m going to be late for work!” she said. So, I went, taking the stairs one at a time, making a point to take my time and savor each of the 12 stairs. I familiarized myself with them, possibly naming a few of them along the way, as opposed to my usual morning stair-skipping trot. As I smiled to myself the thought came to me, this is why I don’t like interacting with people. Now, I’m a story in this woman’s life. She’s going to go into work, grumpy and complaining about the girl in the yellow skirt who took her time down the stairs. She’ll tell her friends how I refused to go, even though she told me to go ahead in front of her and they will all shake their heads at my delinquency. Of course, this is all in my head and by the time she gets to her destination she’d have forgotten all about me. But, just in case, here’s to all the ladies-in-a-hurry. Next time you want to push someone aside, just go ahead of them, or they might write a blog post about you.